This church was erected in 1847 in response to population growth in the area after the Swansea Canal’s construction in the late 18th century. The canal was the main transport artery, and the church was prominently sited alongside it (the canal is behind the church as you look from High Street). It was also close to the Mond nickel factory, whose chimneys are visible in the old postcard on the right (courtesy of Diana Owen Glinternick). People came from the parishes of Cadoxton-juxta-Neath and Llangyfelach to form the new parish. The church’s construction cost £1,473 10s 4½d (c.£140,000 in today’s money). Most of the money came from Richard Hill Miers of the Ynyspenllwch Estate and from local businessman John Joce Strick. See the footnotes for details of businesses involved in the construction – including the pub which supplied beer to labourers! 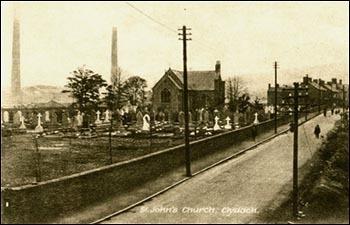 After the opening of St Mary’s Church in 1905, St John’s became the main church for services in Welsh. As the congregation here dwindled, the church was used for community groups before closing in 2006. In 2014 it was purchased by a local landlord, Kerry Bowden, whose family had long been part of the congregation. The building is used for rest and yoga sessions. All of the original church windows remain. You’re welcome to view the interior but please phone 07891 311026 for an appointment, to avoid disrupting classes. Among those buried in the churchyard are both of the church’s main funders, Miers and Strick. 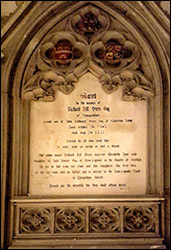 The picture on the left shows the Miers’ memorial inside the church. There are 10 official war graves for people who died in the First and Second World Wars, including Home Guard volunteer Gwilym Morgan Michael, who died in May 1941.